Tema Process B.V., based in Heerde in the Netherlands, develops and builds various types of thermal process plants, for example for drying and cooling products in fluid beds. cpp spoke to Henk Dijkman, the company’s Managing Director, and Mark Kragting, Sales Manager, about these plants and their numerous applications. Mr. Dijkman, Tema Process is an internationally active plant manufacturer. Which kind of plants are part of your company’s product portfolio? Henk Dijkman: We are specialised in the construction of thermal process plants. Amongst other things, this includes plants for drying and cooling, which we offer in a variety of designs. Furthermore, we supply the dedusting and waste gas purification systems which are required for the operation of such plants. The spectrum ranges from jet bag filters to different kinds of cyclones and scrubbers. Mark Kragting: And last but not least, Tema Process also manufactures processing plants for bulk goods, usually in combination with thermal process plants. These are agglomeration plants on the one hand, for instance for processing kaolin or biomass, and special mills on the other hand. You mentioned thermal processing plants for drying and cooling: which industries use these? Dijkman: Besides the chemical industry, our main customers include companies from the construction, quarrying and environmental technology sectors as well as manufacturers of foodstuffs and ingredients. Kragting: The most important application is drying and cooling of products in the fluid bed. However, because of their design, these plants can also be used for calcining, roasting and texturisation as well as for puffing and popping. They are gas-tight and explosion-proof, which means they are additionally suitable for steam stripping and drying in inert gas atmospheres. 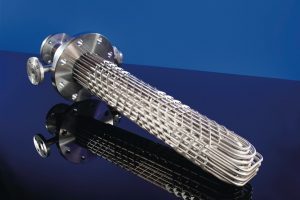 These highly specialised and sophisticated processes are necessary, for instance, to process ion exchangers. Another process that can be realised with our thermal plants is torrefaction. Would you please explain torrefaction? Dijkman: This is when biomass, for example cellulose, is processed within a temperature range from 250 to 350 °C. Back to the fluid bed plants: how do these plants work? Dijkman: Their functional principle is easily explained. The solid matter to be dried or cooled is placed on an aperture plate through which hot or cold air is blown. The product is dried or cooled quickly and gently. The waste air leaves the plant via the dryer hood and is processed in downstream dedusting and waste gas purification systems. We offer fluid bed plants with a static or shaking fluid bed. Kragting: A machine with a static fluid bed is static. By contrast, if it has a shaking fluid bed, the entire machine is made to vibrate. Shaking allows lumpy material to break into chunks and ensures smooth product discharge. How are the plants with a shaking fluid bed made to vibrate? Dijkman: We use a positive drive mechanism with eccentric shafts. This type of drive has several advantages: first of all, the bulk goods to be processed are made to shake uniformly across the entire fluid bed. This has a positive effect on the dwell time; it is almost identical for each small solid part. Secondly, there are no moving parts in the interior of the plant that turn the bulk goods and could produce sparks. And thirdly, the mechanical stress on the plant is reduced. 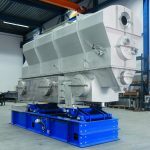 This allows larger plants with operating temperatures of up to 600 °C to be constructed, yet the maintenance costs are lower. You also distinguish between non-fluidised, semi-fluidised and fluidised fluid beds. Kragting: Right. Whether or not the material is fluidised, and if so then how strongly, is determined by the drying air passing through the solid bed. And what kinds of material are the plants made from? Dijkman: From various steel and stainless steel grades. If requested, we can also use special materials such as titanium. What’s more, customers can choose between explosion-proof and non-explosion-proof designs. CIP-capable and hygienically designed fluid bed plants are available too. What are the drying capacities of your machines? Dijkman: That depends on the size of the plant, the temperature and, of course, the product to be dried. Let me explain the range of products by giving you two examples. When drying mineral goods that require very high temperatures, we achieve a water evaporation rate of 15 t/h with a throughput of 200 t/h. With thermally sensitive products such as sugar or pectin, the water evaporation rate is in the region of 8 to 9 t/h for the same throughput but significantly lower drying temperatures. 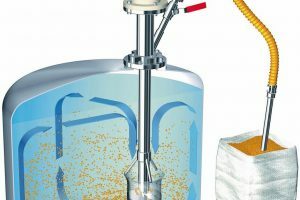 What are fluid bed dryers used for in the chemical industry? Dijkman: For continuous drying of polymers or salts, for example, such as potassium chloride, potassium sulphate or ammonium sulphate, which are later processed to produce fertilisers. If requested by the customer, we can deliver not just the individual dryer but also a complete processing line that we realise in cooperation with Siebtechnik. 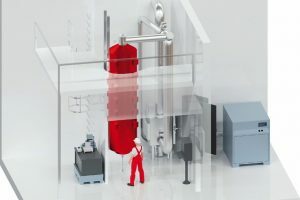 Solid-liquid separation takes place in Siebtechnik centrifuges. The solid cake, which is still moist, is then transported on conveyors into the Tema Process dryers. Finally, the dried solids are screened with sieves made by our affiliate in Mulheim. Tema Process B.V. of Heerde in the Netherlands was founded in December 2009. The company started out with seven staff but in its short history has expanded rapidly – an achievement for which it received the FD Gazelle Award in Gold in 2013. Presented by the Dutch provinces of Gelderland, Utrecht and Flevoland, this award acknowledges the successful business development of young enterprises. Today, Tema Process is a mid-sized company employing 52 people. The global markets are served via a broad network of affiliates and representatives. Siebtechnik GmbH also provides support for international product marketing. 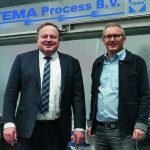 Like Hein Lehmann GmbH and Steinhaus GmbH, Siebtechnik is an affiliate of Tema Holding B.V., which also includes Tema Process. In April 2017, Tema Process will move to a new 1.5 hectare site. The new administrative building with ultra-modern production shop and offices covers an area of 8000 m2 and offers ample room for further growth.